We live in a house of books. There are books everywhere you turn. If you manage to draw your gaze past the clutter of toys, the place could easily be mistaken for a lending library. Reading with my girls is one of my favourite parts of being a mom. I sit and read with them pretty much whenever they ask throughout the day, and every night we snuggle down and read a full chapter from our current bedtime story. My children love books. Adore them. Particularly my eldest daughter. Since she was just a wee thing, she has loved to sit and read to herself. She will spend hours sitting on her bed with a tall stack of books at her side, carefully flipping through them page by page, quietly enjoying the pictures. For years I’ve been thinking, “Yay, I’m doing this one thing right. I’m raising kids that love books. Go me!” But then something changed, the big kid started to learn to read at school. Or rather I should say they started teaching reading in her class, because she most certainly wasn’t learning it. All through Grade 1 and well into Grade 2, there she was not learning to read. I tried to tell myself it was no big deal. Kids learn at their own pace. Plenty of kids in first grade can’t read. No need to over react. But the truth is I was intensely disappointed. How could my book-loving girl not be learning to read? I remember how eager I was to learn to read. I couldn’t wait. Before starting school and when I was in Kindergarten I begged my mother to teach me to read. She refused because she had been told it would be better if I learned with my peers. I remember how excited I was when in Grade 1 we finally got our first readers. Hello Mr Mugs. I was off and racing, and quickly moved on to chapter books. Now here was my darling book loving daughter, and she was most certainly NOT eager to learn to read. In fact she had zero interest in reading, less than zero. She refused to even try. I was utterly baffled. I didn’t know how to encourage her. Her first report card came home from Grade 2 and confirmed what I’d already suspected, she was behind in reading. We were well into the second month of second grade and she still hadn’t hit the bench mark for the end of Grade 1. That panic I’d been holding back quickly set in. I began making a concentrated effort at home to get my girl to read. We live in a house of books. 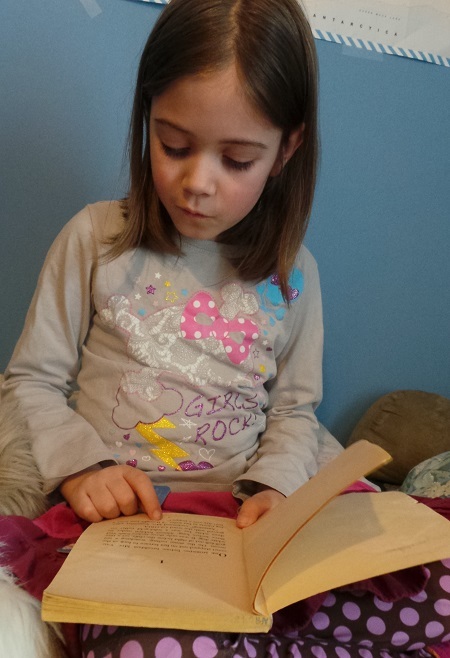 How could my daughter be a reluctant reader? I soon discovered that while our house is full to bursting with books, we didn’t have any books in our house appropriate for early readers. Her teacher told me she needed baby books. Books with one word or one simple sentence per page. The kind I hated to read aloud and had quickly gotten rid of once her little sister moved past trying to eat the pages. So we bought new books. Books clearly labelled “Learn to Read” and Reader Level 1, or Level 0 or Easy. We let the girl pick out which books to get. And I sat with her and tried to encourage her to read these new books. She wanted me to read them to her, but I refused. If she wanted to know the story she was going to have to sound that darn thing out. That last one hit my brain with the sound of screeching brakes. I assured her that she most definitely DID need to learn to read; that reading would allow her to do so many cool things, read so many cool things. She was stubborn, whiny, uncooperative. I was at a loss. I mean this kid loves books, adores them, spends hours staring at them… but she didn’t want to learn to read. I couldn’t wrap my brain around it. Eventually, and this took weeks of prodding, she voiced her real concern — that if she learned to read I would stop reading to her. I solemnly promised her that I would be there making funny voices and reading Oz books to her until the day she decided she didn’t want me to any more, and that if she wanted I would read her a bedtime story every night until the day she moves out of this house. As this promise came out of my mouth I watched her visibly relax, as if a huge weight had been removed from her shoulders. And then, as easy as that, she was reading. It wasn’t instantaneous, but once she put her mind to it she went from non-reader to ahead of her class in reading in a shockingly short space of time. If I had only known that all it would take was a promise from me that I will always keep the bedtime stories flowing, we could have skipped a few months of worrying, and a few weeks of head-butting frustration. What about you folks? Have you ever butted heads with a reluctant reader? Or did your kids breeze through learning to read? I do understand this!! Deanna, our house is just the same. I read from a young age and reading and writing was everything for me. My older girl read at three and four and she'd get report cards stating she was teaching the classmates how to read in junior kindergarten. I lived that. We all live to read but my younger girl struggled. That broke my heart. She is caught up now I think in both English and French but holy cow that's hard to see when you yourself as a patent love reading and find it easy!! Big hugs. Nice work being patient! Wow. You are describing my present reality! My kids LOVE books – we have hundreds of them. But…my 4 yr old refuses to try when I want her to read the book with me, instead of being read to. I will reassure mine as you did yours, and see if that makes a difference. Thanks! Rene, you have got to tell me how it works out! I am super curious to know if it was the same mental block as my little one was going through. This is a really touching story. I find it sweet that the real reason is that she'd miss out on spending reading time with you.Here is why I was drawn to this post: my daughter (8) is an excellent reader. Picked it up really easily and has had no issues. However, she doesn't like reading. This upset me too because as a child I spent most of my time reading and getting lost in story after story.As an adult, I love reading just as much. I know the joy it can bring and I had always envisioned my daughter and I sending endless hours cuddling up and reading side by side. However, at this time, it is not the case. Maybe I should start reading to her more to help ignite the love. Do you have any other tips for this?